The Hidden Truth About UFOs? Please note that this article is hacked on a regular basis and typos may not be from the author. After 30 years of seeking the truth about UFOs and aliens I have learned the following and would like to share it with others so they don't have to pay the high price I have paid for my journey of discovery. One of the most important things I have learned is that our reality is one which is carefully crafted to keep us from being aware of a greater reality that exists just beyond the perception of most people. The reality which is hidden from us remains hidden through elaborate measures to keep us in a state of ignorance and delusion. Perhaps other than religion, no topic has been subject to such a vast and well-funded disinformation camapign as UFOs and aliens. Given the immense effort required to create and perpetuate the disinformation, the truth behind the issue must be of vital importance to those putting forth the disinformation. Seeking the truth about UFOs and aliens can bring a glimpse of the greater reality and lead to a better understanding of the true nature of our existence. However, seeking such such information can also result in being abducted and subjected to mind-control by those who want to keep the information secret. Coping with the greater reality can demand an expansion of consciousness and greater emotional strength, therefore, many people simply ignore the issue altogether. An unidentified flying object (UFO) is any flying object that is simply unidentified, so there are plenty of real UFOs. If you ask if UFOs are alien craft from another world, the answer is generally "No". Since the early 1940's most, but not all, UFOs seen by the public have been highly advanced craft made and piloted by humans. Recently declassifed documents support earlier testimony that Germany had functional long-range flying discs in the 40's and produced the "Foo Fighters" seen by Allied pilots during WW II. By prior arrangement, the US & Russia 'captured' much of the German technology and 'recruited' the most skilled scientists and engineers. With the German technology and engineers, the US & Russia continued Germany's technological leap-frog of decades over most other nations. One of the reasons that WW II was created was this technological leap forward. A few UFOs are indeed 'alien' in the sense that they are not created by human military. In some cases they are time travelers, in other cases they may be probes from another dimension or craft from intra-terrestrials - beings who live inside the Earth. Some of the 'aliens' seen by abductees may be props, genetically engineered creatures or ITs (intra-terrestrials). Most of the information about 'aliens' is disinformation designed to conceal the existence of ancients beings living inside the Earth or modern advanced military craft. There is little evidence to prove that UFOs are actually visitors from another planet. However, there is also no proof that there aren't visitors here from other planets and it is reasonable that intelligent life out there is well aware of Earth and is keeping on eye on us primitive and potentially dangerous humans. Much of the behavior of UFOs cited as proof that they are beyond human technology can now be explained technologically so it is no longer logical that non-conventional aircraft must be from another planet. Craft from more ancient beings who are living inside the Earth, the Moon and Mars. Advanced military craft built by modern humans. Craft from other dimensions, times or planets. Ancient records indicate that flying saucers and other aircraft have been around for thousands of years or more and piloted by beings who previously posed as Gods. Some of the ships that were flying around in the past would be pretty low-tech by today's standards. The History Channel series "Ancient Aliens" presents compelling evidence that technologically advanced beings inhabitated Earth while humans were still quite primitive. However, the show also pushes the theory that the ancient Gods were aliens, may have left Earth and might return some day. It ignores the evidence that the Gods are still here and still interfering with human affairs. Some of the aliens themselves and supposedly 'leaked' info. from the military claim that the 'Gods' and their Grey aliens have been on Earth for about a million years. Archeological evidence shows that relatively modern 'people' have lived on Earth for more than a million years, even if the evidence is not widely accepted. Recent analysis of a fossilized footprint believed to be 1.5 million years old shows that relatively modern hominids walked the Earth at least that long ago. A gold chain was found embedded in coal which is approx. 300 million years old. Numerous other modern objects have been embedded in rock which is millions of years old. This author found an iron spike encased in sedimentary rock that was formed well before the iron age of Homo sapiens. So, if one accepts the evidence and considers the notion that intelligent beings have inhabited the Earth for a very long time and they had flying ships the question then becomes "Where are they now?". Earth has long had a hostile environment. The chances of being eaten, trapped in a flood, avalanche, ice age, hurricane, dying of a communicable disease or parasites, etc. is pretty high. Any civilization that developed technologically would likely have considered moving underground to a controlled environment to avoid natural disasters and the hostile creatures on the surface. Even today, with our ability to monitor the weather and defend ourselves against most threats, our military has constructed underground cities and transportation systems as insurance against potential disasters and as a way to conduct secret and illegal activities. For an advanced species, living on the surface is not necessary nor is it the most sustainable. The fact that many UFOs are seen entering and exiting the oceans or the sides of mountains shows that the craft come from the deep ocean or inner Earth or are at least are hiding out there. Given the violent and destructive nature of humans, it is likely that any beings living inside the Earth would want to keep their existence as inner-Earth dwellers a secret. If they wanted to interact with humans but keep their true origins and the location of their homes secret the best way to do that would be to pretend to be from another planet. Humans have long described the ancient gods as being tall, blond and having blue eyes. Many ancient legends tell how humans came from inside the Earth. The Inca mined and stored gold to present to gods who were tall blonds. Abductees frequently report the presence of tall blond and blue-eyed people during abductions who function as observers. In UFO literature they are often called the "Nordics". These same types of entities also present themselves to contactees as Pleiadians. Contactees frequently start cults that promote the notion that the Pleadians are space-brothers who want to help humans evolve. However, the 'Pleiadians' rarely offer any truly useful information and don't actually seem to help anyone or encourage human evolution and in reality try to limit human development. Truly benevolent tall blonds are reported to come from inside the Himalayas but keep their contact with humans to a minimum. The underground cities of these beings may be the source for the Shangri La / Shambala legends. Most of the tall blonds look down on humans and regard them as inferior and even repugnant. Given our violent and self-destructive nature, their opinions may be well-deserved. As human technology has advanced the gap between humans and advanced species has shrunk. These days, a secret underground alien base is more likely to be a US military base with genetically engineered beings or humans dressed in alien costumes. Some tall blonds are merely genetically engineered humans. 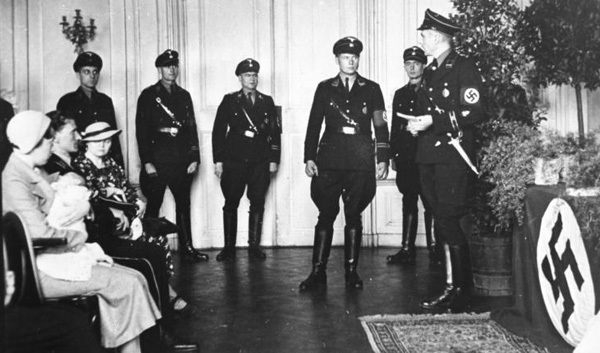 The Nazi Lebensborn program to create a pure Aryan race was continued by the US military and Nazi scientists working in South America and evolved into a program to create cloned machine-enhanced 'super-soldiers'. The program is reported to be successful and some insiders claim that the U.S. military has almost 200,000 super-soldiers (also called cyber-clones) in underground bases. These soldiers are remotely controlled to a certain degree and are raised to believe that surface dwellers are inferior and the enemy. Super soldiers have been spotted in Iraq functioning as 'terminators'. These genetically-engineered soldiers would be used against US citizens in the event that a military takeover faced too much resistence. They may also be used in a staged alien invasion. One of the Nazis involved in genetic engineering was Josef Mengele, an SS physician who used prisoners in experiments at Auschwitz concentration camp. In 1945 he relocated to South America where he continued his work underground and in public. In the German emigre village of Candido Godoi in Brazil, Mengele helped make the town the world's twin capital. Mengele's work was perhaps intended to be a decoy, for the real genetic engineering program went on in secret underground labs in the Andes Mountains near the border of Chile, Argentina and Bolivia, and in other locations. If someone were to investigate cloning research in South America they would first stumble upon Mengele's work and perhaps not investigate further. One clue to the South American lab's location is the presence of the genetically engineered creature known throughout Latin America as Chupacabra (goat sucker). The Chupacabra was seen frequently in the year 2000 in northern Chile, not too far from the Argentina border and near one of the most desolate and isolated places on Earth - a perfect place to hide a secret underground lab. This particular lab cloned the first human in 1969! Other monsters and 'aliens' have also been created in secret military genetic engineering labs and it is possible that many 'alien' encounters are merely encounters with genetically engineered creatures. As far as I know, I have had only one conscious encounter with the 'tall blonds'. It was in the late 80's at a hot springs pool in the Rocky Mountains on a cold winter night around 2 AM. The pool was officially closed but since I knew the management I was allowed to stay as late as I wanted. The pool was next to an open field with mountains on the other side of the field and very few houses anywhere in the vicinty. From the field I heard a low-pitched pulsing sound accompanied by a high pitch sound. The sound came closer and then stopped. From the pitch blackness of the night walked six people, all about 7 foot tall (2.13 meters). They wore identical white robes and had shoulder-length light blond hair. I was in a shadow in the corner of the pool with just my nose above the water. The dim lights around the pool illuminated the well-endowed muscular bodies of three women and three men. The men sat in the pool together and the women sat apart from the men. There was no physical contact between them and they acted a bit like children. The women giggled at the nakedness of the men. If they had been regular people it is likely that there would have been some coupling or at least the usual mating games going on. These beings did not act at all human in that regard. They spoke in hushed tones but what I could hear sounded like a cross between German and Hebrew. After about 15 minutes or so they sensed me and in unison they stared in my direction. They radiated a feeling of intense disgust, as though a dead rat was in the pool. After they saw me they quickly left, walked into the dark field and left in what could have only been a flying craft of some sort as there was no road and the next day there were no tracks in the snow. At below zero temperatures it was far too cold for anyone to have walked anywhere in just a robe and no houses to walk to in the direction they took. The only logical explanation for the sound of their ship was some sort of air craft. Were they aliens just because they came in an unconventional craft, were 7 ft tall and looked nearly identical? At the time I thought that I had seen aliens. However, they could have also been products of the Lebensborn program and from a nearby underground base or they could have been ancients Earthlings. The area has long been known for frequent sightings of UFOs. 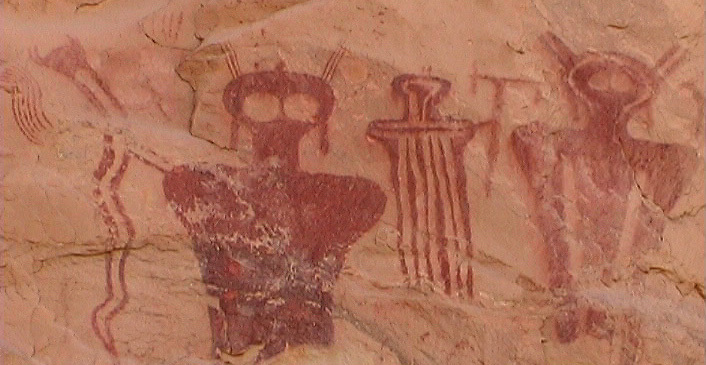 If one accepts the most apparent interpretation of petroglyphs and local native legends, the area from north eastern Utah down to north central New Mexico has long been a mysterious area with frequent UFO sightings that date back at least 1,000 years. The sparsely populated area is still a hot-spot for sightings of UFOs, Sasquatch and other strange things. The US government has long known about the UFO sightings and possible underground facilities in the region. In the 70's a detailed deep seismic mapping operation was carried out to determine where the underground bases might be. In Rulison, Colorado, near Dulce, New Mexico, and in other locations, nuclear bombs were detonated deep underground and the shock waves were measured at various locations. Military insiders claim that a total of 11 nuclear bombs were deontated. One of the seismic facilities can still be seen northwest of Glade Park, Colorado on BS Road, where there are three concrete quonset huts, concrete blocks with sensor connectors and cables running just under the surface of the ground. The 'official' explanation for the facility is that it was for testing conventional explosives, despite the fact that it was obviously setup as a seismic station. It is not at all likely that the facility was used for testing explosives. The military already has plenty of facilities for testing explosives that are not next to environmentally sensitive areas and ranches. As usual, the military is simply lying. 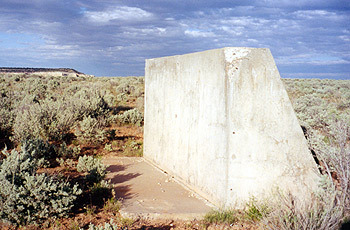 Evidence suggests that the underground bases in western Colorado and eastern Utah were not originally military. It is apparent that the military is trying to reach the non-human underground bases and have setup their own underground operations to wage war against whatever is occupying the underground facilities. People in the Grand Junction area have seen entire military convoys vanishing into mountains where no military facilities exist. Numerous people have seen ships in the area with glowing orange spheres that penetrate the nearby mountains and canyons. The Shell oil shale operation northeast of Grand Junction has security that is seen only on the most the sensitive military bases with three levels of independent security. Personnel who work at the inner most part of the facility live on site and have not been seen to leave. Delivery trucks and outside service personnel are reportedly never allowed beyond the secondary perimeter. Containers are routinely trucked out of the facility to a rail yard in Grand Junction and each shipment is closely monitored. Truckers who are a few minutes late in arriving at the rail yard due to a flat tire or another reason are fired. Something much more sensitive than oil shale mining is likely going on at the Shell plant - perhaps recovery of underground alien artifacts? In other remote parts of the world there are places where UFOs have been seen on a regular basis throughout recorded human history. So, it is likely that the ITs (intraterrestrials) have multiple entrances to their inner Earth facilities.